Despite $1 Trillion in total marketing spend, 52% of Fortune 500 companies reported declining revenue. Benefit from a discussion on how to set an agenda for growth and organize your team’s efforts for success. This webinar touches on the key strategies a CMO must master to create value and identify the special tools that CMOs can leverage to grow the business. 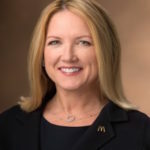 As former Senior Vice President & Chief Marketing Officer of McDonald’s USA, Deborah played a key role in McDonald’s turnaround, reversing sales with strategies that resulted in a significant increase in the stock price. In addition to McDonald’s, Deborah’s CM... more.